Pulse Oximeter – A finger probe reads the SpO2 to the middle screen. Pulse Rate – right screen displays the heart rate from the finger probe. 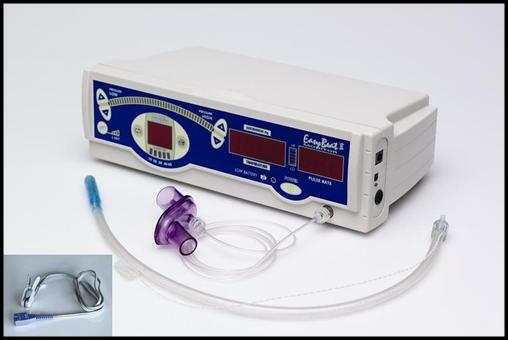 Anaesthetic Leak Tester – Change the pressure range to check for leaks. Other features include a battery for portable use, auto power off feature and low battery indication. What do the messages mean when the pulse-oximeter is starting or drops out? The pulse-oximeter has various information messages - click here. What do the memory settings do? Each memory setting performs a different function which can be viewed here. What does pressing a button on startup do? Each button pressed on startup will perform a different function. How long does the Easybeat last on batteries? The Easybeat monitor should last for at least 10hours with the audio on, or 24hours with the audio switched off at the rear of the Easybeat. A yellow light under the microphone socket indicates if the Easybeat is charging. Please note that since January 2007, high quality Sanyo batteries and chargers have been used, and any Easybeats which have not been serviced since this time, are probably due for a new battery, and a charger. Since January 2007, there have been no problems with the new batteries and chargers.